As anyone on social media is aware videos of animals is a way of escaping for a few minutes of cuteness overload. Dogs are probably some of the hardest working critters doing sled pulling, police work, herders and guide dogs. 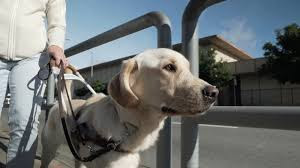 Directors Dana Nachman and Don Hardy follow what it takes for a dog to become a guide dog for the blind. There is a good chance there will be some teary eyed moments. The film opens with testimonies from people whose lives have been saved by their trained companions from speeding cars, stairways and escaping the 78th floor of the twin towers. These dogs were raised from birth to become guide dogs. Of the 800 dogs born to this path, only 300 actually make it all the way through. The story follows the adventures of five new Labrador pups that are given the names of Potomac, Patriot, Phil, Primrose and Poppet. At 2 months old they leave the kennels and given to "raisers" who foster the dogs giving them basic training. Social skills, manners, exercise and exposure the real world. The raisers are from all over the country and have volunteered their time, patience and energy for various dogs. Some are new at it and were a bit upset when they were told their dog was being transferred to more experienced raisers. The dogs wear a harness stating they are puppies in training. At 9 months old they are taught to walk on a short leash and learn how not to be distracted. Hard to do when you are a puppy. The raisers fill out daily reports on how they are progressing and they are evaluated every 3 months. If issues are not resolved, the puppy is given a "career change". By the time they are 16 months they are returned to the kennel there they will be considered for continued training, to be a breeder or sent out for another program or for adoption. The remaining pups are enrolled in an intense 10 week formal training. They are tested on preliminary road work and obedience. If they fail, they are given another chance to improve. The dogs must know how to navigate traffic, sidewalks or non sidewalks, buildings, escalators and elevators. If any of the dogs have made it though these tests, they will graduate and be assigned to a blind person who must come to the facility to be trained with their new guide dogs. About 1100 people apply for dogs a year, and it usually takes up to a year before they are given a dog. The raisers also come to the graduation ceremonies knowing through their hard work and devotion the dogs were able to do their job successfully. Not all dogs have the temperament to be a good guide dog. Out of the five puppies at the beginning only two were able to be the pick of the litter.